Every home needs a well designed system for organizing and storing clothes. Otherwise, everything ends up in heaps all over the place. This custom modern wardrobe closet system includes abundant drawers and two upper cabinets with rods for hanging. It blends seemlessly into the contemporary loft style apartment, but adds the closet storage functionality missing from many open plan loft homes. These modern closets include a bank of ten drawers to handle smaller folded items, while four cabinets contain closet rods for hanging garments. 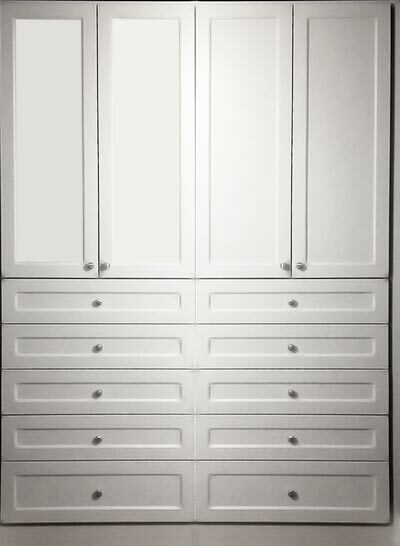 All the storage and functionality of a traditional bedroom furniture suite is packed into this clean, stylish closet. This system includes a separate floating shelf to hold personal momentos in front of a wall of ship lap style horizontal laminate panels installed above the bed for a striking focal point to the room. When a modern wardrobe closet is added to an open floor plan, it greatly increase the "livability" of the space, creating a place to put some of life's baggage without losing the clean, avant-garde aesthetic. Besides, it always feels good when you can shut the door on the clutter. Closet Works designers are masters at devising custom storage solutions for any space and any decor. Careful measuring ensures that this custom wardrobe fits neatly under the heating and air conditioning returns without detracting from its overall appearance. Access to the vents is left in the open for easy maintenance. Lofts are have great open space and high ceilings, but frequently do not include a traditional closet. Closet Works can help design and install custom modern closets and other storage organization systems that are meant to be displayed out in the open! Custom closet storage is also good for your health. A study conducted by Princeton University and published in the The Journal of Neuroscience found that environments that are cluttered restrict your ability to focus. The clutter also limits your brain's ability to process information. Clutter makes you distracted and unable to process information in contrast to the brain's performance in an uncluttered, organized, and serene environment. A well designed storage system will eliminate clutter and mess by making it simple and easy to keep things tidy and organized.